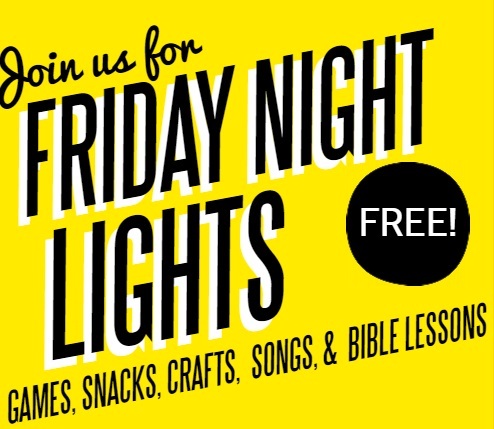 Our Friday Night Lights kids program happens ONE FRIDAY A MONTH during the school year. As always, we will have games, snacks, crafts, Bible lessons, and singing (not to mention prizes)- just like a miniature Vacation Bible School once a month. These Friday Nights will be geared towards 5 to 12-year-olds. Children under 5 years old are welcome but must be accompanied by a parent. Parents, as always, are welcome to stay to see what their kids will be doing and learning.